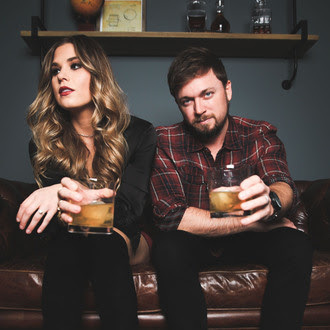 On the heels of the release of their bluesy new single “Wishful Drinking,” rising Country duo, Indigo Summer, has premiered the official music video, exclusively on ‘The Boot’. Watch the video Here! The dreamy and contemplative “Wishful Drinking” video showcases Indigo Summer, comprised of Bryan Edwards and Hope Nix, performing at a bar as a story of lost love, pining and an attempt to move on unfolds between two actors (played by Katelyn Campbell and Andreai Hippix). Stephen did an amazing job of capturing the message of this song through the storyline of the video. They gave us great direction throughout the making of this video, helping us bring our A game to the shoot,” says Nix. Directed by Stephen Byrum and Dylan Price, the “Wishful Drinking” video was shot over the course of one evening in Nashville. The shoot for this video was unique in the way that we had very little space to work with. Our director and his team worked their magic and transformed the space into the perfect backdrop for this song. This was the first time anyone heard ‘Wishful Drinking,’ so we were so happy the actors and extras loved it. We had a great time hanging out with everyone on the set, and even made a few new friends,” Edward added. The track, produced by Indigo Summer’s own Bryan Edwards, was co-written by Edwards and Ashlee Whitley of Post Monroe. The song was mixed by Mark Lonsway, programmed by Tony Esserly and mastered by Dan Shike. “Wishful Drinking” is the first of four singles to be released by Indigo throughout 2018. Indigo Summer took country fans by storm with their self-titled album released in October of 2017. The project featured all original songs co-written by the duo, Bryan Edwards and Hope Nix. Indigo Summer’s full-length debut album introduced a fresh and exciting sound to the modern country music landscape. Meeting at a songwriter’s night at Nashville’s famed Hotel Indigo in December of 2010 (hence part of the duo’s name), Hope and Bryan quickly hit it off with their musical similarities. The two began writing together and from those sessions, their partnership grew to include performing and producing together. As solo artists, they have performed across the country and opened for some of the biggest names in the industry, including Keith Urban, Jason Aldean, and Charlie Daniels. As songwriters, they have had numerous cuts and TV placements, including songs recorded by Jason Aldean and featured on the Discovery Channel. Jason Aldean Issues “Rearview Town” Album Details…And A Duet With Miranda Lambert!